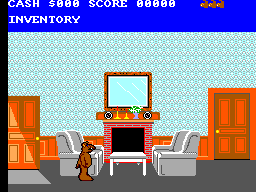 Only the NTSC version exists. Some copies have appeared in Europe with special UPC stickers attached to the outside of the box. "The world's favorite bad boy alien is back...on your Sega System! 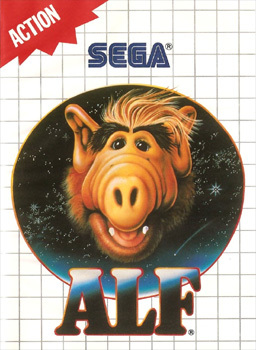 It's Alf! And he's got a mission...get to Mars to visit his friends Rhonda and Skip! The problem is, his space ship is broken. And the Alfer is not about to grow wings. So it has to be fixed...and that's where you come in! 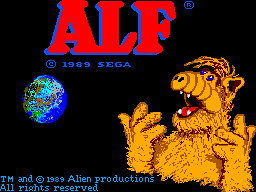 Guide Alf as he searches for the things needed to fix his ship. Pearls snatched from the jaws of giant clams...space scooter fuel in the darkest caves...spacesuits, costumes and more! 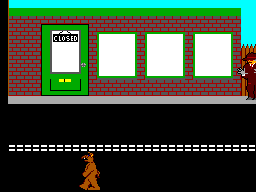 Alf's Sega adventure will take you from the bottom of lakes to the moon, through houses and across busy city streets. Some things you will be able to find. Others you will have to buy. And all the while, you'll have to keep on escaping from the creepy clutches of the Alien Task Force! You never know where they'll appear next! Succeed, and you'll send the Alfer on his way to a happy reunion. Mess up, and the Alfer stays stuck on Earth. Do you think you can do it? "NO PROBLEM!" "
Grab the cat in the kitchen, then the salami in the refrigerator. Go to the children's bedroom. Pause the game. Then press Up/Left on the Directional Pad and Buttons 1 and 2 simultaneously. Save States (for MEKA) by Death Adder in .ZIP format. 8kb in size. Sega Pro magazine review scan, September 1992 issue.